Down the Rabbit Hole We Go...: Having Good Manners is Really Just Living with Other People Pleasantly. Having Good Manners is Really Just Living with Other People Pleasantly. 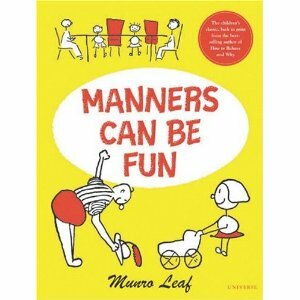 A couple of years ago I was visiting a friend in Vancouver and as we wandered down Commercial Drive checking out the specialty shops, I came across some classic books on manners. I'm one of those people who has the opposite of buyer's remorse, instead of buying and regretting it later, I don't buy and then wish that I had. I like to think that I am thrifty, but my husband just calls me cheap. Unfortunately, later I couldn't remember the names of the books or even the author. I later stumbled across them on Amazon and when my sister-in-law asked what the kids needed for Christmas, I requested these books. She was able to pick them up at Anthropologie and now they reside in the kid's bookcase. 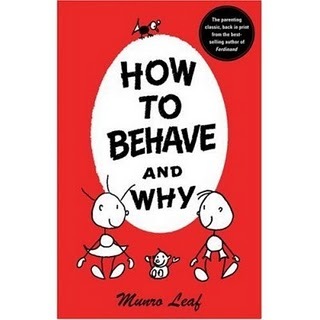 I love their timeless lessons on behavior and manner's. After reading one of them to the kids this afternoon, I was surprised when my oldest daughter cleared her stuff off of the table and set it for supper without being asked! She was extra kind to her little sister (for about an hour) and supper was a remarkably calm and civilized event, unlike the normal meals that involve a lot of yelling (by the kids) and begging (by me). We'll see how much of it sticks!